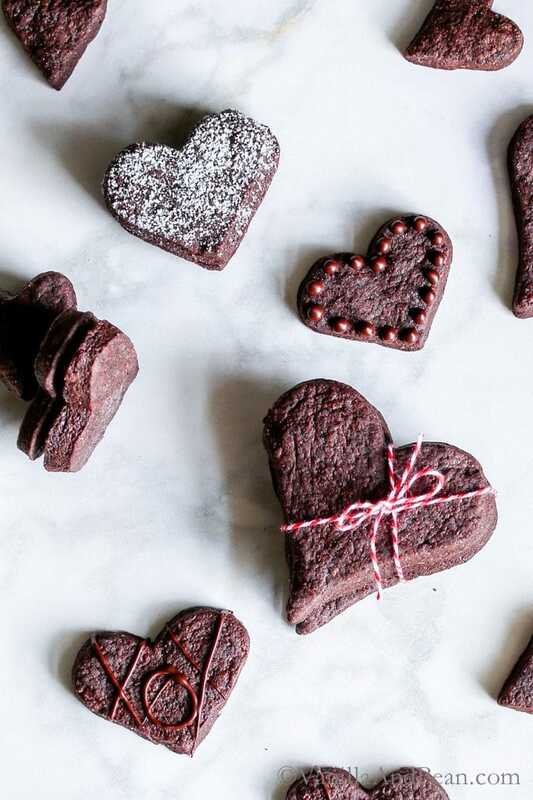 Rich and over-the-top chocolatey, Vegan Dark Chocolate Shortbread Cookies can be cut any shape. Make sandwich cookies, decorate them or enjoy just as they are. A treat anytime of year! Vegan. I just made some matcha tea and put on my favorite fleece socks to take the chill off. Snow has been falling since mid morning and it’s beautifully still outside. This is the second time within a week we’ve had snow, a rare event in the lowlands. The mountains, on the other hand, are covered. A snowshoe trip is in order. Do you love it or loathe it? Valentine’s Day, that is. I used to love it, then I loathed it. Now, I’m on the fence. Is it age or wisdom…. neither? Don’t get me wrong. I wouldn’t turn down a bouquet of tulips, a romantic dinner or a big box of Fran’s Chocolates. OMG. But Rob typically forgets (ahem, low priority). I used to fight it, but now I’ve come to accept that it’s just not his thing. Then I go get myself bouquet of tulips and bake something chocolatey for Rob. A box of chocolates will be happening too. I will say it’s a good excuse for chocolate. Anything chocolate, but it has to be dark. 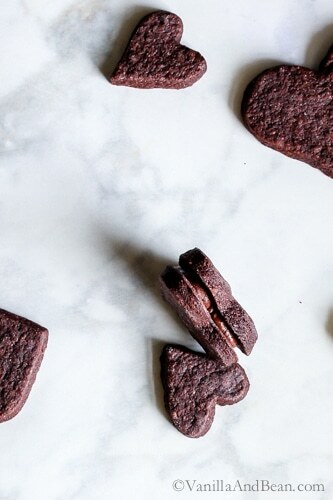 These cookies are adapted from my Dark Chocolate Cocoa Nib Shortbread Cookies. But instead of using butter in these cookies, I used coconut oil. And just in case, because I know there will be questions, I cannot taste the coconut oil. 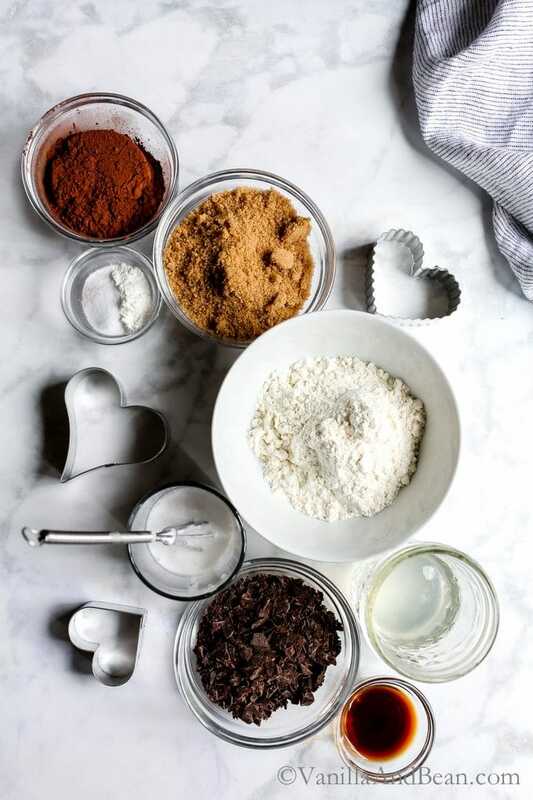 The cocoa and sugar mask its flavor… so it’s all about the chocolate! I included several ways to decorate the cookies just in case you’re in the mood. Sometimes I’m not, but a girl’s gotta have options. For sandwich cookies, you’ll whip up an easy coconut milk-based ganache, just like in these Vegan Peanut Butter Kisses. 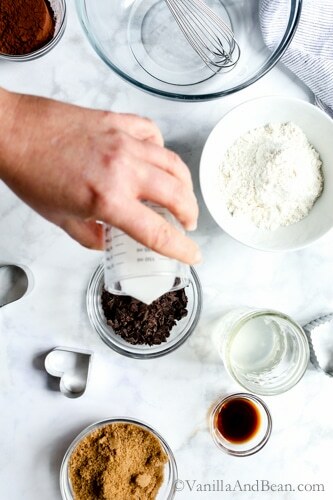 Using a pastry bag or Ziplock bag, simply pipe the ganache onto the cookie in a V shape, then gently place the top cookie on. The ganache sets up and holds the cookies together. This is my favorite way to make these cookies. That creamy center makes me happy (!!). If you want to get all fancy and write on the cookies, simply melt a little chocolate and pipe words, letters or pearls on the cookies. I recommend a paper pastry bag for this simply because you’ll need to cut a tiny hole to control the flow of chocolate. For a no-fuss approach, dust the cookies with powdered sugar. Simple, yes, but so pretty. Like snow. 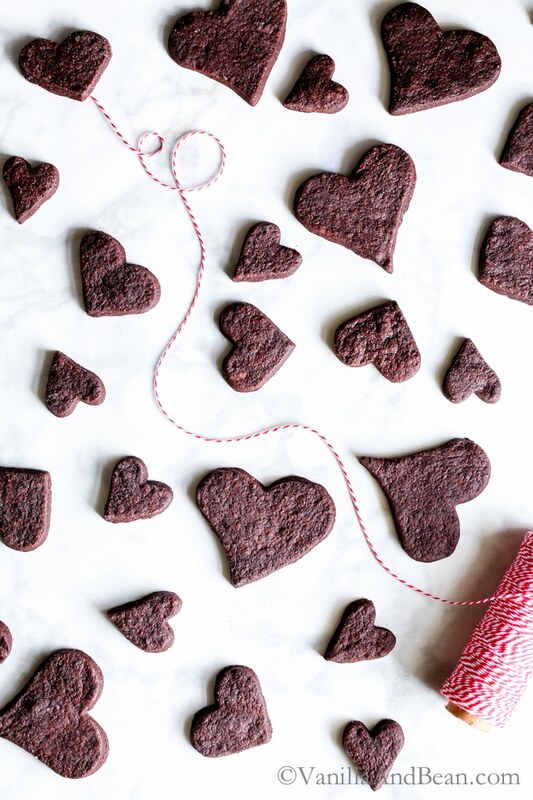 You can have your own little Valentine’ Day party with these cookies. Or, wrap them up in festive bakers twine and give them to friends or tuck them in your love’s lunch box. 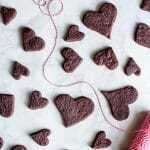 Rich, and over the top chocolatey, Vegan Dark Chocolate Shortbread Cookies can be cut any shape. Make sandwich cookies, decorate them or enjoy just as they are. A treat anytime of year! Make the dough ahead and refrigerate for up to three days, or freeze for up to one month. Time below does not include amount of time for refrigerating the dough or decorating. Due to cookie cutter size variation, cookie yields may vary. Vegan. Egg-Free, Dairy-Free. 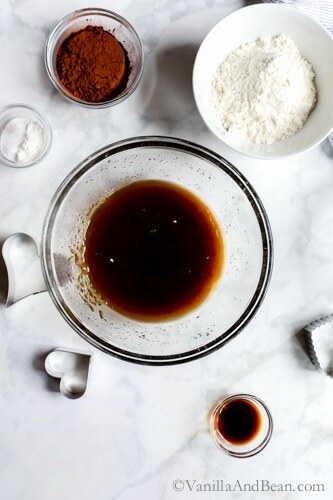 In a medium mixing bowl, add the brown sugar, melted coconut oil, vanilla extract and water. 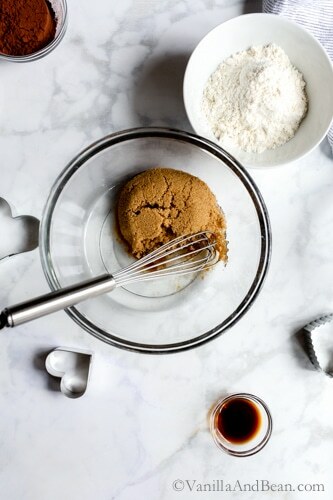 Using a whisk, whisk vigorously until the ingredients are incorporated and the sugar is fully hydrated (this can be done in a stand mixer with a paddle attachment). 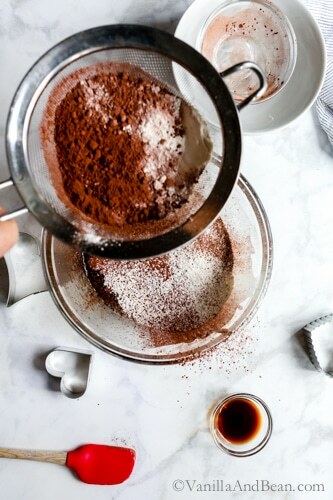 Place a sifter over the bowl and sift in the flour, cocoa powder, cornstarch, salt and baking soda. 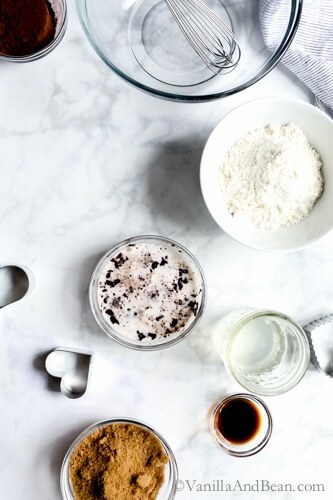 Stir with a wooden spoon until the ingredients come together. The batter will thicken as you stir and work in the flour, but it will seem loose... different from any cookie batter you've ever made! Press on. Eventually, knead the dough with your hands for a few seconds until the flour is fully incorporated. The dough will be very soft, sticky and supple. Shape the dough into a 1" thick disk, wrap in plastic wrap and place in the refrigerator for at least 15 minutes (this allows time for the flour to fully hydrate, the gluten to relax and the dough to become more pliable and solid). If refrigerating the dough longer, it will need to set at room temperature for about 1/2 an hour before the dough is soft enough to work. At this point too, the dough can be frozen for up to one year. Place in the refrigerator overnight to thaw, then proceed. Generously flour a work surface. Unwrap the dough and sprinkle more flour on top. Use as much flour as you need to prevent sticking. 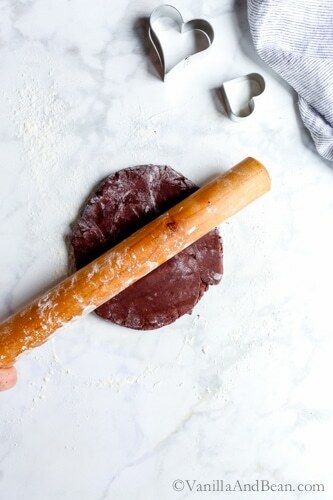 Use your rolling pin to gently beat the dough (it will still be soft) - to condition it - making it just a bit flatter. Begin rolling the dough into a rectangular shape to just under 1/4" (6mm)***(see note), dusting with flour as needed to prevent sticking. 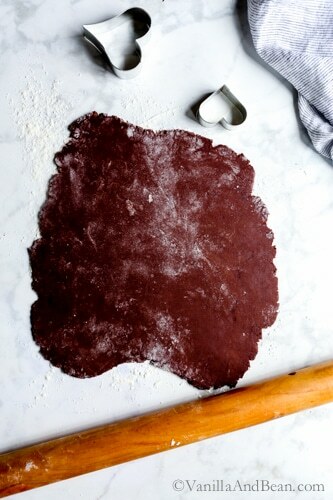 Dip the cookie cutter into flour and cut the dough into the desired shapes. I use this and this cookie cutter set. Transfer the cookies to the prepared cookie sheet. Gather the scraps, reroll and cut, repeating the process until all the dough is used. Refrigerate the cut dough for 20 minutes (this is so the cookies will hold their shape) and preheat the oven to 350F (180C). Bake for 19-21 minutes, starting to check at 18 minutes due to oven variations (dark chocolate cookies can be difficult to tell if they're done because of their dark color - I typically bake mine just past 21 minutes to make sure the cookies are dry). The cookies will still be slightly soft to the touch, but will firm up as they cool. They should be crisp when cool. Once completely cooled, decorate then store in a lidded container for up to two weeks. Pour the milk over the chocolate. 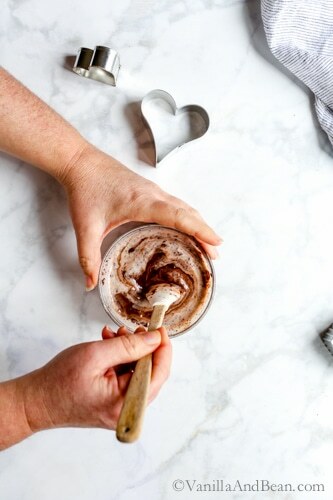 Give the bowl a shake to make sure the chocolate is covered. Let set for 2 minutes - this is required (set a timer). Stir gently to incorporate the milk and chocolate. Be patient here. This could take a few minutes. Once all the chocolate is melted and the ganache is smooth, place a piece of plastic wrap directly on the surface of the ganache. This will eliminate a skin forming over the top. Pop in the fridge for at least 30 minutes while the cookies bake and cool. For Sandwich Cookies: Remove the ganache from the refrigerator. 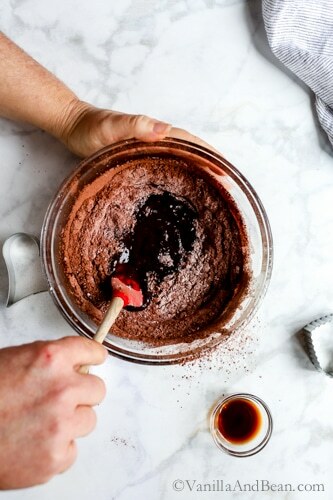 Scoop the ganache into a piping bag or into a Ziplock baggie. Cut a small hole in the bag or corner of a Ziplock. Gently squeeze the bag releasing about the ganache onto the cookie in a V shape form, following the shape of the heart (a little goes a long way). Gently place the top cookie on the ganache with very little pressure. The ganache will set yet still remain creamy while holding the two cookies together. If at any time the ganache becomes too thick to pipe, gently warm it in the microwave for a few seconds at a time. This isn't to melt the ganache rather, just to soften it. Store any unused portion in the refrigerator for up to one week, covered with plastic wrap (it's especially tasty in hot chocolate). 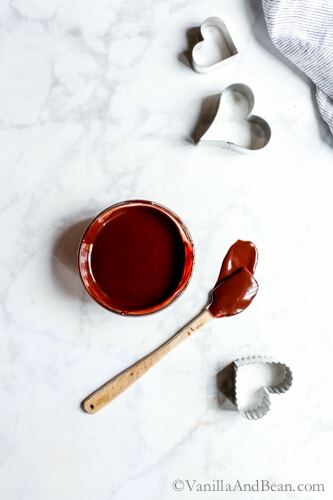 For the Chocolate Drizzle or Decorating: In a bain marie*, gently melt the chocolate, stirring occassionally. Drop in the oil, stir and pour melted chocolate into a paper piping bag. Cut the tip of the piping bag so that only a very small amount of chocolate flows out when pressure is applied to the bag. Decorate as desired. *This video will help you set up a bain marie. 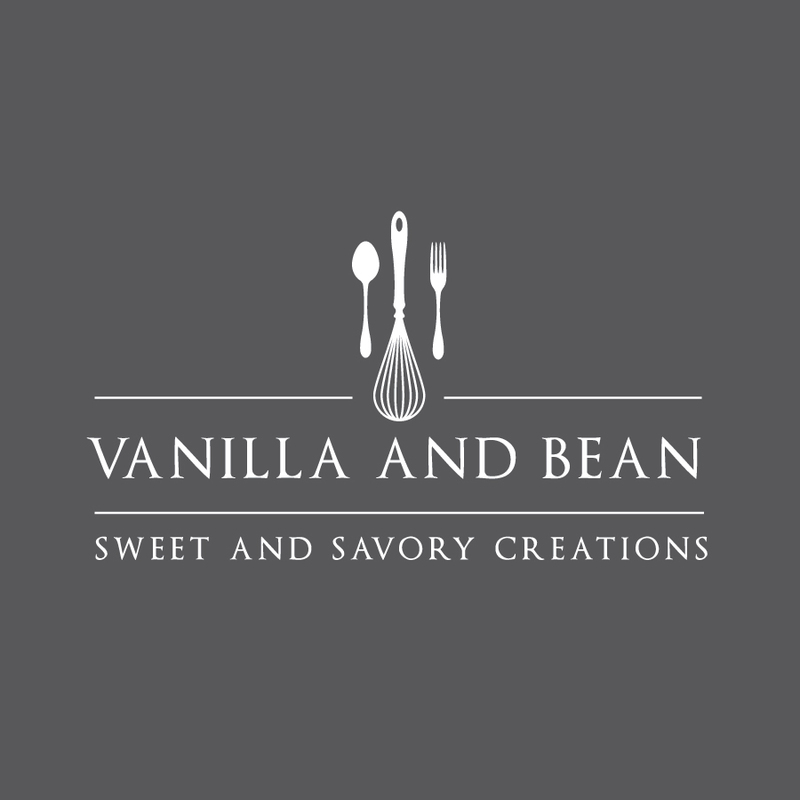 **This resource lists many vegan chocolate brands. Find what's at your market and use it! Green & Black's, Theo, Endangered Species, are excellent. ***Slight variations in cookie thickness can impact baking time. Be sure to start checking your cookies at 18 minutes. They will be slightly soft and not darker around the edges when done. Recipe adapted from my Dark Chocolate Cocoa Nib Cookies and Vegan Peanut Butter Kisses recipes. Those look utterly delicious, I can’t believe I saw them today on the first day of Lent when I have just given up chocolate! 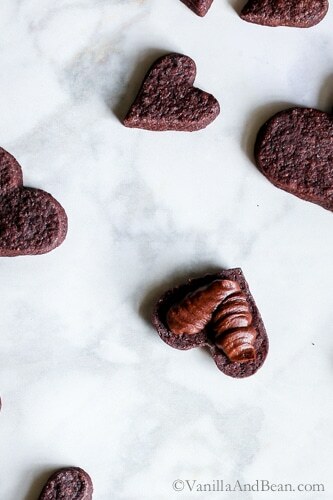 I made these cookies for valentine’s and I can’t believe how friggin amazing they are!! I haven’t had cookies like this since giving up dairy a couple of years ago, and it was so nice to be able to eat shortbread again! The dough, although it might seem a little wet at first, is perfect after it’s chilled and it rolls out and cuts like a dream. To anyone reading through these comments to see if others found the dough too wet, it does work, don’t add more flour! Traci tests her recipes to within an inch of their life and I have never had one of her recipes come even close to failing. I can’t say enough good things about how amazing this is, Traci. I also substituted light spelt and coconut sugar, and they still turned out perfectly, which normally isn’t the case when switching spelt for all-purpose. It’s a great low-fuss recipe and I know I’ll come back to it again and again in the future. Oh … yes, Frans. It’s such a treat visiting her shops. Her dark hot chocolate is to die for.. omgggg! Thank you Rachel! These are just perfectly lovely, Traci! I have to say, I would definitely have to opt for making it a cookie sandwich – double the goodness! It sounds like it looks beautiful with all that snow right now. It’s felt like spring here for the last couple day (what?) and I’m kind of wishing we had a bit of snow too! Happy Valentine’s Day, friend! xo. We don’t usually do much for the last couple of years we have gone out to eat for a nice dinner. I think the blog has forced me to take advantage of any excuse not to cook. Sometimes you need a break and if it means giving in to a Hallmark holiday then so be it, lol! 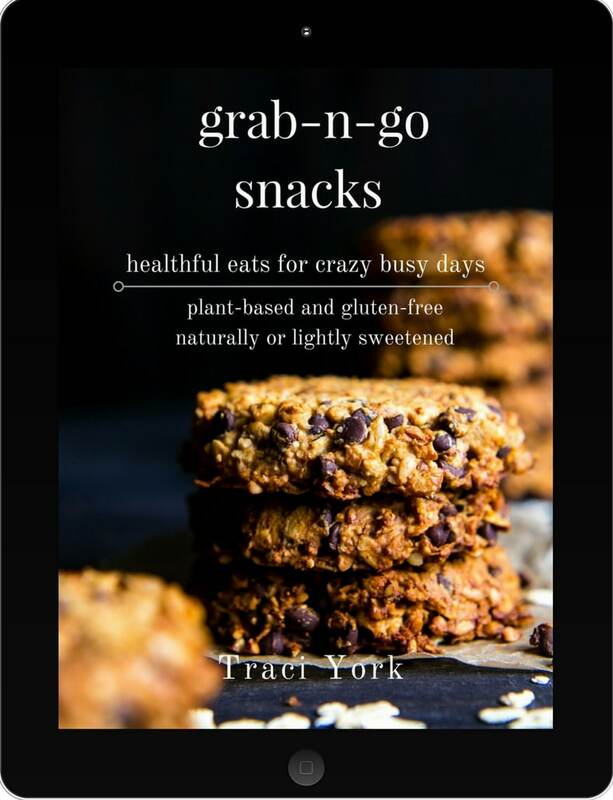 Hi Traci, can we use vegetable oil or butter instead of coconut oil? Hey Traci, I stuck to this recipe and used butter instead. They turned out to be really good :) Made them for Valentines day and decorated using a lot of hearts ❤ Wish I could show you a picture! Thanks for the recipe. Oh wow! That’s good to know! I totally didn’t think it would work due to the added water. Thank you for your note Mansi! I’d love to see a picture… please feel free to share on social media, or email it to me! Thank you for your note! I have made the dough and it is in the refrigerator. It was not at all difficult to incorporate the dry ingredients with just a rubber spatula. The result is on the gloppy side of dough in consistency. Is the amount of flour in the recipe correct? Thank you for your note and correspondence via email with me on this, Mary! My error was in the coconut oil.. I transcribed it to the recipe wrong. Thank you again for your help and patience. I think Valentine’s Day is a perfect excuse to eat chocolate and fun, festive treats, so I’m a fan. These cookies look delicious! As I need these scrumptious cookies. I am a shortbread fan and chocolate fiend so it makes sense I need a baker’s dozen stat, right? WITH that ganache of course! Okay, Kevin, here ya go… give these socks a try! A baker’s dozen… socks on, cookies in hand… bliss! I’m with ya… and it’s so sweet of you to support your little minions – I know they have fun with it (when I was teaching it was a BIG deal to the kids! .. so much drama!). OMG.. those sandwich cookies, Amisha (it must be a taurus thing :D ). I can’t wait to make these!! My husband and I have a tradition of staying in on Valentine’s Day. Partly because we had no money when first dating and married. Partly because we show affection throughout the year. Usually it’s a homecooked meal that we don’t always have like a big pasta dish. Since becoming pescatarian several months ago not sure what will be in store this year. Well these cookies will be had that I can guarantee!! Thank you for sharing, Robyn. Way to go on your dietary shift! Now, I’m with ya on the big pasta dish. Last year I made Rob and I a broccoli pappardelle recipe that was over the top! I think I’ll whip that up again or something with pasta :D I hope you enjoy the recipe, Robyn! These are darling, Traci. I love them! And I’m on the fence re: Valentine’s Day too. I mean, I hate that it’s just so commercial (which is basically every Holiday now). And when you’re coupled it, there is a lot of pressure and money that seemed to be involved to make a special day. And when you’re single, then it feels kind of blah. So I don’t know. But I love cookies and chocolate and flowers and all things heart shaped and pink, so I’m gonna just roll with it as an excuse to have those things! Lol. Happy snow day. We’re about to get slammed here today with weather. Yikes! Pressure and blah… I think that’s why I’m on the fence – more apathetic, I think. So why not do something special for ourselves.. you know, self-care! I’m all for that! So, yes, lets have chocolate cookie hearts and something pink, if even only for today :D – I’ll take the snow too! Beautiful, Traci. I don’t care much about V day, but if it’s about love and an opportunity for special food, I’m in! I have always been a big Valentine’s Day fan Traci! And Tom is such a sport because he goes along with it too! Perhaps a bouquet of flowers and a dark chocolate bar may be in my not too distant future. And my gift in return is always a homemade dinner. We don’t fight the crowds, we just relax at home together. And what a lucky man Rob is to get some of these fabulously dark shortbread cookies! Shortbread is one of my favorites and the darker the chocolate the better! I have a good friend who is vegan, so I’ll definitely be giving these a try to surprise her! Thanks for sharing and I’ll be holding out hope that Rob surprises you with some pretty tulips! I love that you and Tom celebrate together! :D It gives me hope, Mary Ann(!!). Ahhh… and homemade dinner, such a special and sweet gift. I’m with you.. I love that part too. I’m with you on the darker the better. How sweet of you to make these for your friend.. I hope you two enjoy them! 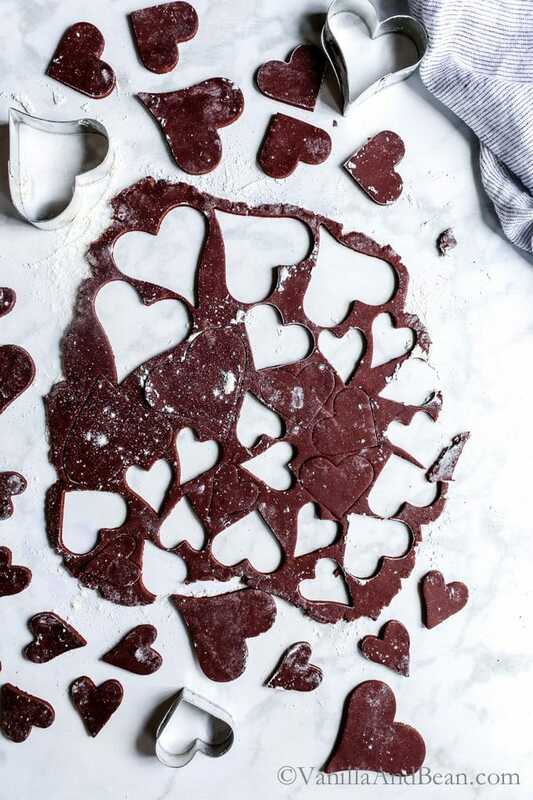 I’d love to find these adorable cookies waiting for me on Valentine’s morning! We go back and forth depending on our mood. Sometimes we’ll go to our favorite restaurant for a little Italian and sometimes we’ll stay in and cook up a meal together. The older I get the more I prefer the latter. Have a great weekend, my friend! I’m with ya, Annie! LOL… “the older I get…” I’m SO with you! These are adorable and you can do so many different things with them. Valentine’s Day is kind of a bust at our house too. My husband never makes a fuss and it just goes unnoticed. Boo hoo! At least I can make cookies like these for myself!